Interesting topic indeed. The lack of feedback regarding its status when you submit a place, as well as the lack of answer from the places@atlasobscura.com made me decide to stop submitting places. I only now check the places added to see if it is a place I’ve been or want to go. But why should I spend time to submit places to not get any feedback? The way I did it in the past, is that I create a quick entry, often without pictures, so that I do not forget and could work on it later, sometimes much later (1 year, 2 years). But I realised that once an entry is created, if not accepted right away by the people selecting, then they seem to never check it back, no matter how many edits you did, added pictures, improved text, etc. In short, I want to thank the people that still bother submitting, as it gives me some interesting readings, and help me in planning some motorcycle trips. Yea I get what you mean. I considered stopping a few times too, but then I come across a cool place and want to document it. I’ve had some 1-on-1 emails with Eric which went great, but the new person is not as responsive unfortunately. I don’t think that I’ve ever gotten a reply from the places@ email. I understand that not all my suggestions are ideal for the atlas and that they can’t all be accepted over night, but the process really needs work. It helps to see that I am not alone in this. I do really think that they are doing their utter most best to deal with everyone and there are probably a few thousand spots in the queue right now, so I get that they don’t look through old submissions. But edits should go to the top of the list and be reconsidered each time they get edited. I completely understand your frustrations with our communication surrounding submissions, and I do apologize. It’s definitely an area that needs a lot of work and improvement. It’s important to remember that we’re a small team and each one of us are doing our best to both keep up with the incoming flow of user submissions and remain in close communication with each user that reaches out to us. Our Places team works hard to make sure that your submissions get the attention they deserve. We recognize that as we’ve grown, our ability to keep up with these things has sometimes fallen short. There are also aspects of the submission process that users such as yourself, @Enzo_RhodeHagen, and others have brought to our attention, where we’re not providing the support we’d like to give to those who take the time to submit to the Atlas database. A number of these changes will likely require some substantial projects that we’re hoping can get put in place soon. In meantime, I hope you’ll stick with us and keep communicating your feedback. Again, we appreciate your patience while we try to improve, and thank you again for taking the time to share your thoughts. I’m sorry to hear that so many of your submissions got lost or seemingly weren’t given the attention they should have been. We really do try to review each submission and edit, and bring them to some kind of resolution as quickly as we can, and I understand your discouragement that we weren’t able to provide that on a number of your entries. We often receive more submissions than we can vet, and they are often prioritized by much of the criteria listed at the top of this thread. We’re actively working on new processes to make sure that submissions no longer fall by the wayside. If there are any more of your specific place entries that you would like us to take a look at, please do continue to let us know and we’ll do so. Frustrations aside, I thank you for continuing to give Atlas Obscura a chance. I hope that as we continue to improve, we can earn back your confidence in submitting. Thanks again for your patience. I understand and really appreciate the stuff you guys are doing with these forums and the transparency that it brings. IMO it’s clear that people are frustrated and that you care and want to solve it. I will do my best to keep posting and staying active. Could you (Or someone else) maybe take a look at the places that I posted above? 1.5 of them go out. (I think that the Katarina elevator is pending and it has been edited.) The rest still still has not change. Don’t get me wrong, I don’t need them published now, but feedback on if they are in the loop for eventual publishing would be nice. I think that most of these are complete enough at any rate. First, thanks for all your work, it’s truly inspirational for me ! In all cases thanks for your attention ! I gave it a short edit to give it more flow. I didn’t check the history, etc though. I definitely would agree that this is a good place for the atlas. It’s a very beautiful castle. Thank you a lot for the edit ! The great benefit of this forum is the transparency you show through your answers, thanks for that. I would think the firt kind of feedback would be something like ‘not atlas-obsucuresque as per our criteria’, ‘Interesting site but need Rework on the wording’, ‘Interesting and would be published to a further date according to our workload’ or the like. I had that kind of feedback /recommendations years ago when exchanging emails with the places@email address, but now it is radio silence. As the site content and traffic, so the advertising revenue, is linked to user generated content, I do believe that attention should be given to communication and feedback with users (and this forum is a great first step). I understand not everything could or should be published, this decision belong to the team managing the site and not to the users. Thanks for your feedback and transparency again. I am not sure about the Haut Koenigsbourg, as as a French this is a rather famous place to visit, like your visitors count at the end of the article shows. Nevertheless, your article explains some stuff I was not aware of, despite having been there twice, so for this it brings value. As Neuschwanstein in Austria is on the site as an example, I guess the Haut Koenigsbourg could be. On my side, I am more waiting sites on Atlas Obscura to be sites out of the beaten path, stuff that you do not find in main touristic guides. The site helped me discover places close to places I lived that in some instances even locals didn’t know. That I love to go and discover. I agree, this would help a lot. But the Forums are really helping IMO. A lot of my stagnant places are now pending. Also maybe there could be a prize for submitting stuff at some point? Like send a tshirt to people with 50 or 100 places. I always found this difficult to be fair. Often there is some big known place, but still lots of people don’t know. Like I wouldn’t put the statue of liberty on here, but if there is some cool place in there then why not? Thanks for the feedback and great suggestions. I’m glad you are finding the forums helpful. I appreciate your continued patience while we try and improve, especially in our communication with users. We have a number of priorities as a company and we’re trying give each one the time and effort it deserves, and that includes improving the experience for our users. Thanks again for your continued feedback! What makes a place worthy of addition to the Atlas Obscura database is something that is discussed a lot here, and our decision-making on that is based on a number of factors. When it comes to places that might be too “well known,” our decision takes into account, among other things, whether those outside of a specific region might still find a location surprising and wondrous, and if the submission reveals any hidden or exciting details about the place. As always, wonder will always be a bit subjective, but we are always trying to bring stunning and incredible places and foods to peoples’ attention. And at the end of the day, if you find a place a bit too mundane, there’s thousands more that might spark your curiosity! I agree that it is difficult regarding the places to put in or not. That is why I mentionned that I was not clear in my mind for the Haut Koenigsbourg, as there are some interesting anecdotes in the text. The Statue of Liberty example is in fact what I mean. It could be famous, but there maybe something hidden or that nobody sees. As an example, there is the Eiffel Tower on Atlas Obscura, but this is for a special ‘hidden’ appartment for Gustave Eiffel. I did not know about this, thanks Atlas Obscura. And finaly, to get your feedback, here is one of the submission that I just created not to forget about it around maybe 2 years ago, but that I reworked only recently (reworked the text, Added Creative Commons pictures, etc). Let me know if you find it worthy of Atlas Obscura, and if yes, if there is Something that needs to be improved. 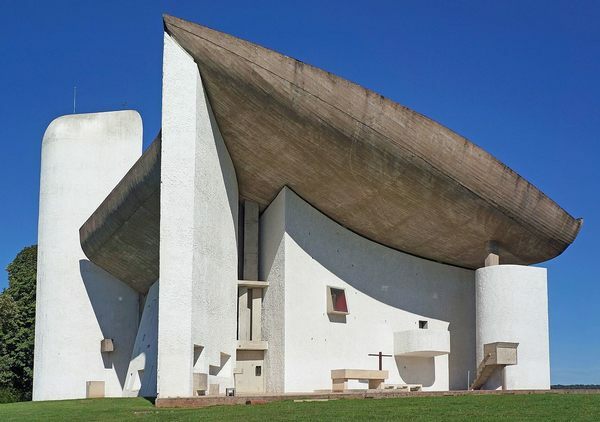 A Roman Catholic chapel by Le Corbusier in the countryside. Not saying that we should remove anything or be more strict, but maybe be less strict even? Apart from the few super popular holiday destinations (London, Paris, Brussels, Amsterdam, Berlin, etc.) most people know nothing about most cities and having the ‘more well known’ attractions on the atlas could convince them to go there in the first place. Like sure once you google Rovaniemi you find the santa village, but why would you ever google Rovaniemi? Who has even ever heard of that place? You need to stumble across it on the net, get interested and go. So maybe don’t put on the Eiffel tower, or the Big ben, but why not culture palace in Warsaw? Or the Opera house in Prague? etc. I added a lot of stuff to Leiden, NL and Stockholm and anyone who visits either cities can now have a pretty fun tour across all of them. I think that it helps. It certainly does for me! Thanks for this general topic. One of my submissions have also been stock ‘‘pending’’ for about a month now, I assume it wasn’t approved because of the lack of valid sources besides Wikipedia, sadly could not find a more detailed source elsewhere (other than local articles with brief summaries) and there isn’t much history to it other than ‘‘nobody wanted it, eventually somebody did but controversy happened’’. Wish I got an email about this with suggestions on how to improve the article. I removed some pictures that may have been unintentional advertising, which is not allowed. For now it will remain ‘‘pending’’ as I have no idea what else can be done to fix it. Hi! I’m sorry to hear that your submission was not responded to. I’ve directed it to our places team, and hopefully we can provide you with some resolution. Apologies again for any frustration this might have caused, but thanks again for your patience and taking the time to let us know!